If there were ever a real-life Horatio Alger story, it was Emery Roth’s. The son of a Jewish innkeeper, one of eight children, he left his impoverished family in 1884 following his father’s death. At only 13 years old he boarded a steamship for America. Once here, the boy shined shoes in the Midwest to eke a living. Unbelievably, by the 1920s Roth was one of America’s most successful architects—despite never having been formally trained. Best known for his innovative apartment house and hotel designs, not even the Wall Street Crash could slow him down. In 1929 the hulking New York Athletic Club stood at the corner of 59th Street (now known as Central Park South) and Sixth Avenue. It would not survive much longer. The Club was demolished and construction begun on Roth’s St. Moritz Hotel in 1930. The 36-story pile rose to dramatic, complex set-backs where occupants enjoyed breathtaking views of Central Park. Although the bulk of the structure was clad in brown brick and ornamentation was reserved for the three-story base and the uppermost floors, Roth’s 1,000-room hotel cost about $6 million. The St. Moritz took its name from the upscale Swiss winter resort town. Its mayor presented the hotel with a huge painting of the city by Giovanni Giacometti which was hung in the marble lobby. Upscale 1930s hotels almost necessarily included a dining room where orchestras provided dance music for patrons in evening clothes. In the St. Moritz it was located on the 31st floor and was decorated with murals depicting scenes from Omar Khayyam poems executed by David Karfunkle. In 1932 the Sound Club, whose members were involved in the radio industry, took over the top three floors as its club rooms. The club included a private dining room large enough for dinner dances, as well. Ornamentation on the lower floors included medallion busts. The St. Moritz offered accommodations to both transient guests and permanent residents. It quickly became a favorite among professional athletes and theatrical figures. Among the first tenants were boxer Jack Dempsey and his wife; and Fox Studio executive Donald E. McIntire. The Depression was heavily affecting the motion picture industry and in May 1931 McIntire was asked by studio president Harley L. Clark to recommend changes. His report was so impressive that he was made active head of the studio. The pressure of the new position was too much and McIntire suffered a nervous breakdown, resulting in his resignation in March 1932. McIntire’s doctors treated him in his 21st floor apartment here; but his anxiety was too great and on December 22, 1932 the 42-year old leaped from his window to the pavement below. Despite its well-known residents, financial problems resulted in the Bowery Savings Bank's taking over the St. Moritz in 1932. It was quickly resold to hotel mogul S. Gregory Taylor. But any difficulties going on behind the scenes went unnoticed by the public. In 1939 the Works Progress Administration’s New York City Guide noted that the St. Moritz Hotel was “noted for its continental atmosphere, and its Café de la Paix, a sidewalk restaurant, is reminiscent of its Parisian prototype.” The Café de la Paix indeed brought a touch of Paris to Depression-weary New Yorkers and is considered to be the first sidewalk café in the city. Among the residents from the entertainment industry at the time were actor Robert Morley, who took an apartment in 1938; tenor Giovanni Martinelli of the Metropolitan Opera (considered by some to be the successor of Enrico Caruso); and comedian Joe Penner’s widow. In 1950 the St. Moritz was updated, including a full redecoration of the interiors to mid-century taste. It became home to baseball player Billy Martin during the winter of 1956-57. His biographers, Bill Pennington and Scott Waxman, note in their Billy Martin: Baseball’s Flawed Genius note “Bellmen loved him (and his big-tipping ways)." That same year another baseball great, Mickey Mantle, lived at the St. Moritz. Billy Martin recalled to Ronald B. Scott of People magazine in 1977 that he and Mantle were caught dumping water out a window of the St. Moritz onto passersby below. Along with the Café de la Paix was Rumpelmayer’s café. It was perhaps as well known as the Austrian-born caterer’s Paris café. The splendid Art Deco interiors were decorated by German-born architect Winold Reiss. Rumpelmayer’s was famous for its coffee and ice creams. And it was the ice cream that would cause a stir between two American icons around 1952. One summer afternoon Joe Dimaggio and Marilyn Monroe were passing Rumpelmayer’s with Dimaggio’s son, Joey, who was around 12 years old at the time. According to Morris Engleberg and Marv Schneider in Dimaggio—Setting the Record Straight, Joey wanted an ice cream soda. Marilyn sneaked a $20 bill into Joey’s hand. Distracting Dimaggio by saying she wanted to look at something in a boutique, she directed Joey into Rumpelmayer’s. When he realized he had been duped Dimaggio was furious. The three hurried along Central Park South with Dimaggio “loudly bawling her out.” Despite the very public display, Joey had gotten his Rumpelmayer’s ice cream soda. Along with famous entertainers and athletics were, of course, guests from the main stream; sometimes including the not-so-respectable. On Tuesday, December 1, 1964 three “Florida models,” two women and a man, checked into the hotel. Susan Peterson, Victor Baretto and Linda Pembroke, all between 24 and 25 years old, had a felonious plan. What they did not know was that police had received an anonymous tip and detectives checked into the suite next door. The three walked through the hallways on the night of December 2, ringing doorbells. If no one answered, they picked the locks and burglarized the rooms. The detectives, unseen, watched as they looted 39 rooms of $30,000 in cash, jewelry and furs. The trio of thieves went back to their room, packed the stolen goods, and headed out of the hotel. Police were waiting for them. They were arrested in the lobby and charged with grand larceny and possession of burglary tools. The St. Moritz was about to undergo a series of new owners. Harry Helmsey sold it for $72 million to Donald Trump in 1985. Only three years later Trump more than doubled his money when he sold it for $180 million to Australian tycoon Alan Bond. Unable to meet his loan payments, he lost it the hotel to his lender, F.A.I. Insurance in 1989. In January 1997 Donald Trump—never known for architectural sensitivity--was back in the picture. He partnered with F.A.I. Insurance to gut the venerable structure (which did not have landmark protection), encase the façade in glass, and convert it to condominiums. The St. Moritz was closed on April 20, 1998. But a week later, on April 29, the scheme changed. Hotelier Ian Schrager purchased the St. Moritz for $185 million and reopened it with no changes at all. It was a short-lived reprieve, however. 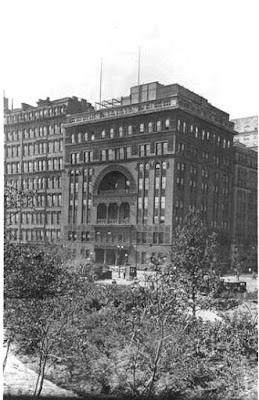 On November 6, 1999 Schrager sold the building to a development syndicate which, with the Ritz-Carlton Hotel Company, gutted it and converted it to a Ritz-Carlton hotel-condominium, “The Ritz-Carlton New York, Central Park.” The conversion included extensive exterior restoration by architect Gary Edward Handel, including reproducing some of Roth’s damaged ornamentation. The topmost floors had suffered extensive weathering and were stripped; the masonry and ornamentation replaced with “exact copies of the Roth originals,” according to Handel. Opened in April 2002, it operates as a hotel with 277 rooms on the lower 22 floors, while the top 12 contain eleven staggeringly-large residences. In 2008 one apartment sold for $28 million and in March 2012 a duplex was put on the market for $77.5 million. Outside, however, strollers along Central Park South notice few changes to Emery Roth’s Depression Era hotel, other than, perhaps, the replacement windows. The 2002 restoration was unusually sympathetic to the original design, preserving a colorful piece of Manhattan’s residential history.